Finding Dory – “Just Keep Swimming” – What's for Dinner Moms? Yesterday was Mama’s Day in our house. The Mama wanted to see Finding Dory so we all headed to the movies last night. I have to tell you I love the theater we go to. The tickets are $5.50 (opening weekend and it was after noon. Tickets before that are $2.75!) For us to get a corn dog, a hot dog, nachos, 2 boxes of candy, 4 large sodas and a medium popcorn it was $17. Yes, you are reading that correctly $17! It was $49 total for tickets and snacks. If we went to the local regional chain theater it would have cost us $43 just for the tickets. I like that theater because it is closer and a much nicer theater but for the price difference I will drive the 20 minutes. “Finding Nemo” was the first movie my daughter remembers seeing in the theater when she was 3. We were kind of excited to see this film as a family now. I know there have been all kinds of warnings all over the internet about possible triggers in the movie for adopted people and those who have abandonment issues and I could see where this movie might bring those up. There were even a few moments where I as a parent teared up thinking about losing my child. But, the bigger take away for me was at the very end of the film. 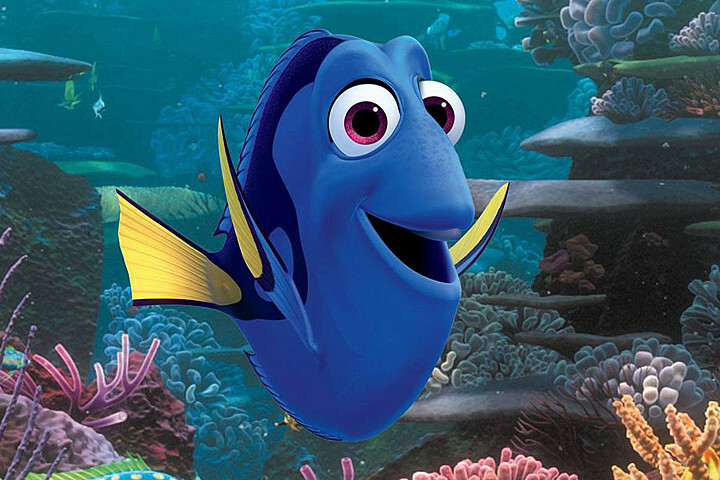 Dory’s parents acknowledge that she does learn differently and it may taker her longer to learn things but to look back at all she has learned and accomplished. She is different, but then again aren’t we all? Whether you are a Destiny the Whaleshark with poor eyesight, Hank the Septapus (an octopus who lost a leg), or even Marlin the Clownfish filled with anxiety there are a wide array of characters each dealing with their own issues but helping each other along the way. We took my kiddos this weekend. It was their very first theater movie. So exciting. Great review! Cannot wait to take my kiddos! Thank you. Hope you have a wonderful day! It was really a good message. There were some laugh out loud moments for the adults too. I love it when it’s fun for adults. Zootopia was like that too, highly recommend! We were back home in Hawaii when they were doing the “cattle call” for a “new Disney/Pixar movie” and needed folks from Hawaii to do voice-overs … I should have gone for the interview! How amazing that would have been! Thanks for sharing this, very special! I thought is was really cute at points. It was cute. Dragged a bit in the middle but was so happy in the end. Me and my kids are headed out to see this tomorrow. Looking forward to it! We have decided to see it again on Sunday. So glad you went out to the movies as a family! Brings back so many memories of us taking our 4 children. I wish we would have had the movie theater prices you are getting,and I am happy for you. We did all the drinks and popcorn and spent a fortune. But it was so worth it! Hearing all of us laughing,or sniffling and talking about the movie later for hours. My daughter took our 3 & 5 year old grandbabies and they hardly moved in their seats. Glad the movie was a blessing for you and your son. “Just Keep Swimming” is something I say to “Keep Moving Forward”! Thank you! We often have “adventures” which can be as small as going for a walk in the woods to a trip somewhere. This was a fun adventure as I saw everyone leaning in to laugh over a joke and now my kids can’t stop saying, “Off” to each other and giggling like they did at the movie. Wouldn’t trade it for the world.